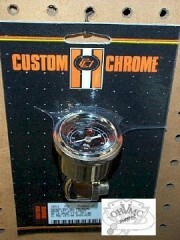 Liquid-filled 60 psi oil pressure gauge with unique chrome-plated adapter permit gauge to be mounted to the rear rockershaft, replacing the rockershaft end plug. Two versions available early and late to accommodate the different thread pitches of the stock rocker arm shafts. Easily read while riding your bike. Fits Shovelheads 1966 – 84 and Sportsters® 1957 – 85. Select your year / model application from the option menu below.